Penguin and Pinecone is a children’s picture book, written and illustrated by Salina Yoon and published by Bloomsbury (2012). 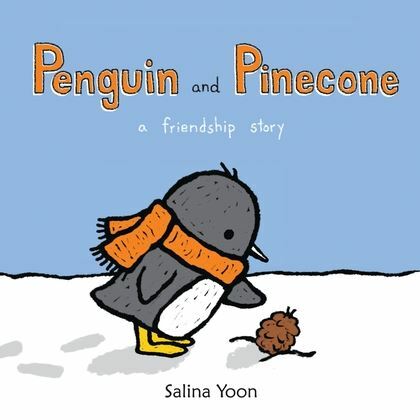 When little Penguin finds a lost pinecone in the snow, an unlikely friendship blossoms. But Grandpa reminds Penguin that pinecones don't belong in the cold - they need to be in the warm forest far away. Although he will miss his friend, Penguin returns Pinecone to his proper home. Penguin dreams of a reunion with his friend and when they do meet again, he's surprised to find that Pinecone has grown bigger and taller than he ever could have imagined! There’s something about this chubby little penguin that tugs immediately at your heart strings. As if penguins aren’t cute enough already, Yoon endows this one with pragmatism and a very caring nature. He loves his little pinecone friend so much he even knits a scarf for him! It’s details like the scarf being wrapped around a tall pine tree when Penguin returns to check on his friend that children will truly appreciate. Yoon’s illustrations are perfect for the target age range of under fives. Characters are clear and colourful against uncluttered backgrounds, and there’s a ton of joy and energy in both text and pictures. Get more of an idea of this charming children’s picture book via the video below. NOTE: The Book Chook will take a short break over Easter and be back on April 4, 2016.